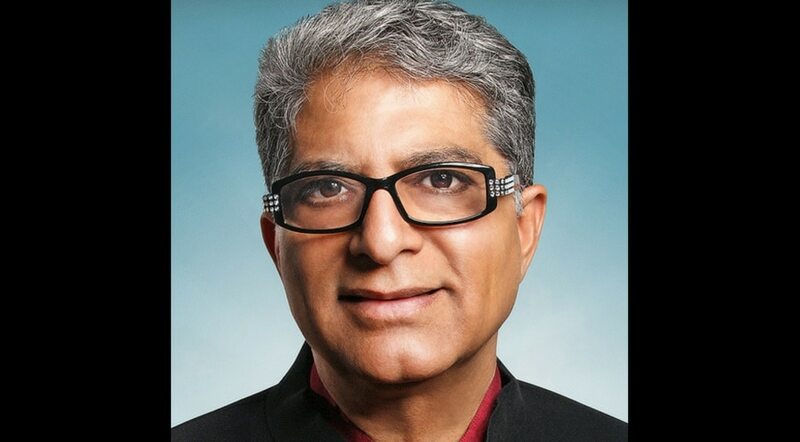 Deepak Chopra, famed Indian medical doctor turned troubadour for spiritual awakening and ayurvedic medicine, is an expert in the field of mind-body healing, a world-renowned speaker and author on the subject of alternative medicine. Although his philosophical roots are linked to The New Thought Movement, including the typical array of “Positive Thinking” and “Law of Attraction” distractions, Chopra tirelessly points to The Bhagavad Gita, the Kabbalah, meditation and awareness as the vehicle to the obvious conclusion: consciousness is the foundation of our experience of reality. Like Wayne Dyer, Chopra gently spoon feeds his Western audience serving contemplation as the tool for discovery of “Oneness” or the universal, impersonal nature of consciousness. The author of numerous books on alternative medicine, Deepak Chopra was born in New Delhi, India, in 1947. The son of an eminent cardiologist, Krishnan Chopra, Deepak at first decided against following his father’s career path, wanting instead to pursue a career as a journalist. Eventually, however, he became enthralled with the subject of medicine and enrolled at the All India Institute of Medical Sciences in his native city. He eventually ended up in Boston where he began his career as a doctor. After becoming disenchanted with Western medicine, however, Chopra turned to alternative medicine. In 1995 Chopra, already a prolific book author, founded the Chopra Center for Well Being in Carlsbad, California. After a meeting with transcendental mediation guru Maharishi Mahesh Yogi, Chopra quit his job at New England Memorial Hospital and started the Maharishi Ayur-Veda Products International, a company that specialized in alternative products, like herbal teas and oils. Co-founded with the Maharishi, the company successfully launched Chopra into the world of alternative medicine. For more on his work, please visit The Chopra Center where you can find his online library, live events, and online courses. Also, check Deepak’s website for additional information on his articles, events, videos, and more. And, you can watch more of Deepak’s videos in our library.